Super Savings Item! Free Shipping Included! 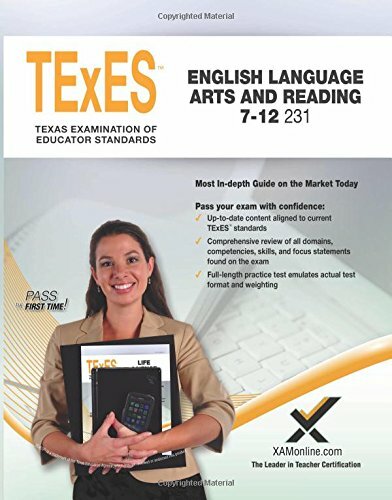 Save 33% on the 2017 TExES English Language Arts and Reading 7-12 (231) by XAMOnline at Translate This Website. Hurry! Limited time offer. Offer valid only while supplies last. The fresh classroom scenario-based questions for this sample test are sure to prepare you for the TExES English Language Arts and Reading 7-12 (231). The fresh classroom scenario-based questions for this sample test are sure to prepare you for the TExES English Language Arts and Reading 7-12 (231). You’ll have the ability to review English Language Arts content and standards unique to Texas, such as the Texas Essential Knowledge and Skills (TEKS). Some of the specific topics covered in this text include: • Diversity in the classroom • Curriculum development • English Language Learners (ELL) • Assessment • Reading comprehension • Oral communication • Literary analysis • Media literacy This teacher certification preparation book includes a sample test with 125 multiple choice questions, two sample essay prompts, an extensive review of content for each competency, and 57 suggested resources for additional reading. You’ll be able to check your answers using the answer key and review detailed explanations for each multiple choice question. This study guide is perfect for college students, teachers, and career-changing professionals who want to teach English in Texas. If you have any questions about this product by XAMOnline, contact us by completing and submitting the form below. If you are looking for a specif part number, please include it with your message.